By now, your kids might be whining to you about their home packed lunches. It’s a month in, and the lull has set in before Halloween, when suddenly their lunches will be filled with sweet, not-so-good-for-you treats. Anyway, if you’ve read this blog for awhile, you’ll know that I don’t see gifts as necessarily being tied to occasions. In fact some of the best ‘presents’ are sweet surprises you bestow upon loved ones, which includes packing a little something special in your kid’s lunch, or hey, if you’re packing a ‘big kids’ lunch (for your husband or wife) as well. Without further ado, here are six swell sandwich accoutrements to get smiles on the faces of your favourite folks when they hit the lunch hour. What’s not to love here kids? Especially for kids since ‘peanut free’ is a very hot topic when packing school lunches – and these scrumptious snacks are clearly marked and individually wrapped to provide you peace-of-mind. 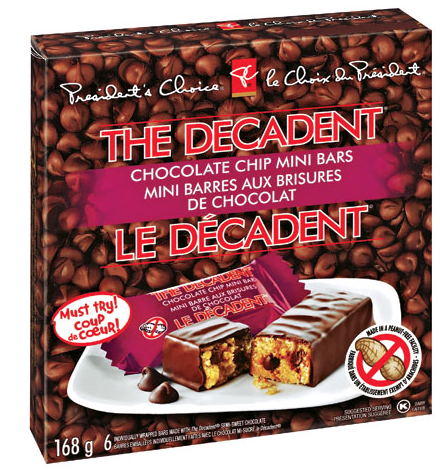 Beyond the parental-pleasing-power, they also win major points with kids – the bar is like a chocolate chip cookie in chewy form, and it’s wrapped in a layer of semisweet chocolate, in fact, it’s the very same chocolate you’ll find in PC’s legendary Decadent Chocolate Chips. And as an aside? It’s so delicious, your kids won’t even catch onto the healthy snack size portion. 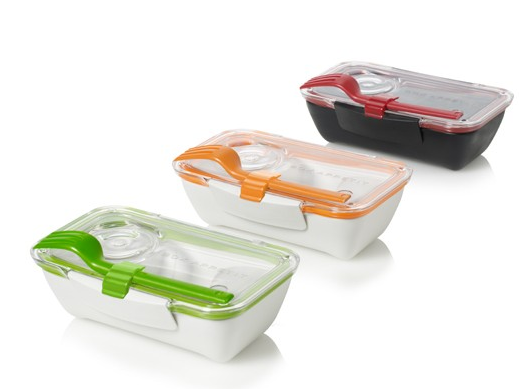 Have you caught onto the bento trend that’s sweeping lunchrooms of schools and workplaces alike? The premise may be familiar – using a reusable lunchtime container to minimize waste and plastic baggies – but the execution is decidedly creative. Traditionally speaking, a bento lunch in Japan (the origin of the very fun-to-say bento) is comprised of a visually appealing, balanced meal that’s usually made up of rice (or other grains), veggies, and a smaller serving of protein (like meat or beans). In North America, the trend has caught on with artistic would-be chefs that are making a creative use of their evening (or restaurant!) leftovers by creating patterns, arranging food in an artful display, or including fun shapes like radish rosettes or tomato stars to make the meal extra enticing. Looking for some insane inspiration? Start here with Anna The Red’s bento gallery! My mama is a pretty wise lady, and recently she educated me on a study about what tips & tricks the longest-living societies abide by. One of their big to-do’s? Eat a handful of nuts everyday – something you’ll be hard-pressed not to do when you’re munching on these amazing kettle cooked almonds from President’s Choice. Now chances are you’ve probably heard of kettle cooked chips, and are wondering how it works with nuts. 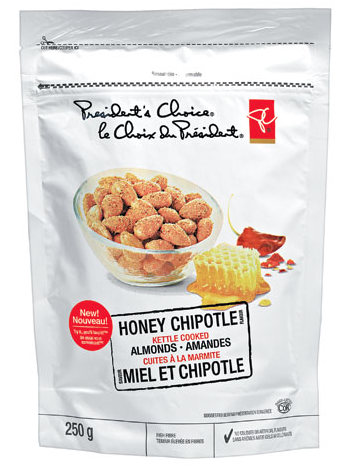 I can tell you they actually replicate the light airy taste of nuts you pick up at a carnival, only in this case, come in zesty savoury flavours like sweet & spicy Honey Chipotle and summer sendoff Barbeque Mustard. Portion them out to get your daily dose of healthy nutty proteins, or tuck an entire bag in your spouse’s briefcase for a fun work week snack. 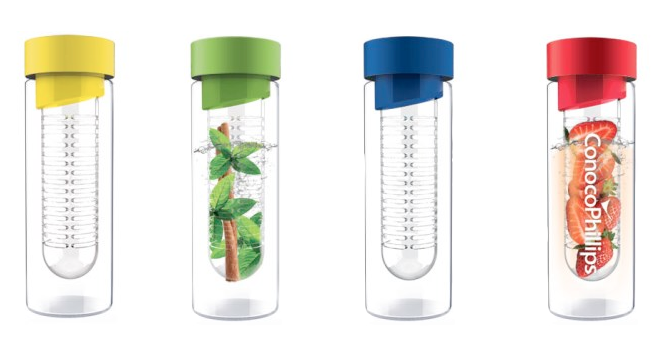 Get those 8 cups of water into your system easy peasy with one of these glass water bottles. The twist? They come with a built-in diffuser, so you can naturally flavour your daily water dose with everything from sliced cucumbers for a heavenly spa-inspired experience to sliced fresh fruit for a tropical splash to the ever-classic lemon wedge. Looking for some inspiration for what to tuck in your bottle? Check out this fun blog post! Makes a lovely, practical gift for a coworker or friend, or to wish your spouse luck with a new job. Some foods are what I call smiley foods. If you see them in your lunchbox, you will fully break out into a smile. 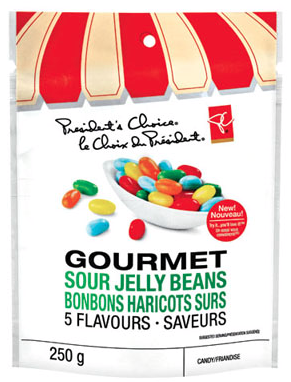 And maybe even start with dessert, especially when it’s as yummy as these gourmet pucker-worthy PC jellybeans. In five tongue-zapping fruity sour flavours, they’re a feast for the eyes as much as a delight for your mouth, and a perfect capper to any meal. Throw a few into the kid’s lunches as a surprise snack, or tuck some into your sweetheart’s lunch with a love note about how sweet it is to be with ’em. Hey, you know what? I get it – sometimes a little plastic container just isn’t going to cut it when it comes to packing up that mile-high deli sandwich, or those perfectly sliced apples. 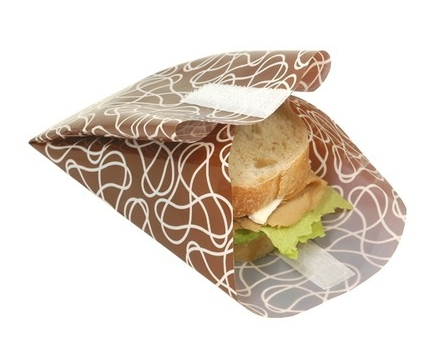 But if you’re still feeling guilty every time you pull out a plastic bag, consider these food cozies your saviour. These reusable wraps allow you to seal up just about any lunchtime must-have, and when you’re done, simply give them a quick hand wash, let them air dry, and re-use! The stain-resistant material makes them work even when you’ve got an extra big smear of mustard or cream cheese, while the fun colours and designs make them suitable for big kids at heart and little ones’ lunches. Best of all, when they’ve finally worn out their purpose, you can actually just snip off the velcro and recycle them. My daughter would love the fruit infusion water bottle. I’m a sucker for jellybeans! Will definitely pick some up on my next superstore shopping trip.